Son Nguyen, M.D., F.A.C.S. is a physician at Association of South Bay Surgeons in Torrance, California. Dr. Nguyen specializes in general surgery, hernia surgery, and advanced laparoscopic surgery, and treats appendicitis, breast cancer, colon cancer, gallbladder stones, hernias, lipomas, melanoma, internal masses, and many other conditions and illnesses. He is known as a highly knowledgeable and very supportive doctor among his patients. 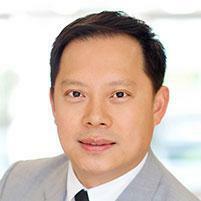 Dr. Nguyen earned his undergraduate degree at Muhlenberg College in Allentown, Pennsylvania. He then participated in genomic imprinting research at University of Pennsylvania. Dr. Nguyen earned his medical degree at Temple University School of Medicine, followed by an internship at Christiana Care Hospital in Newark, Delaware. He completed a residency in general surgery at Abington Memorial Hospital in Abington, Pennsylvania. Dr. Nguyen was recruited to join Association of South Bay Surgeons in 2008. He’s currently taking new patients, so call Association of South Bay Surgeons anytime to arrange an appointment.